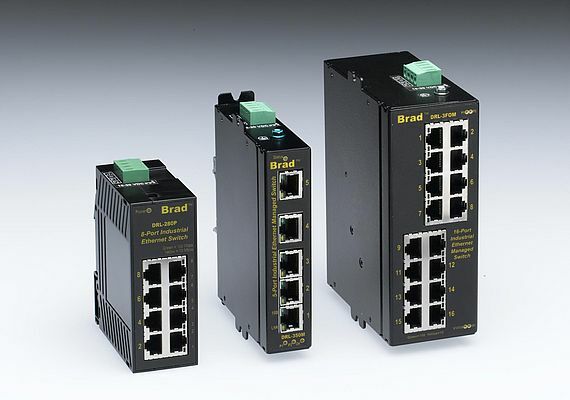 Molex introduces a B series of managed and unmanaged Brad Direct-Link Ethernet Switches that provides performance across complex industrial networks in a wide range of control and monitoring functions. Determinism is the assurance that control communication will occur in a set period of time and this requires the use of industrialised IEEE 802.3 protocols, such as EtherNet/IP, PROFINET or Modbus TCP. Built in accordance to UL508 and UL1604 safety standards, the switches can withstand extreme operating conditions. Unmanaged, standard duty (SD) switches in tough Lexan polycarbonate provide a network solution for a wide range of low-end DIN rail applications. For tougher, heavy-duty (HD) industrial DIN rail or panel mounting applications, the aluminum enclosure provides IP40 performance and reliable operation between -40 to +85°C.